Achieving skin rejuvenation at a cellular level with pure medical-grade oxygen. 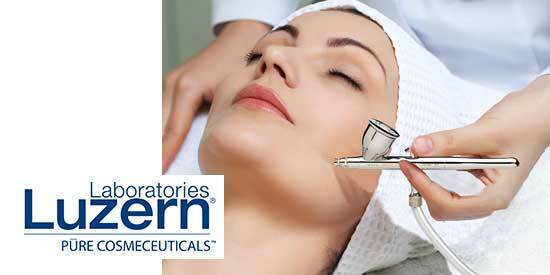 Instantly boost your skin with a Luzern skin therapy that is customized to target your specific concerns. An oxygen blast will deliver powerful anti-oxidants and nutrients to the skin. A must have treatment before any night out or special occasion to restore your youthful glow! Manual cleansing manipulations and individual exfoliations prepares the skin for an infusion of moisture binding cosmeceuticals. These medical grade actives featuring rare alpine organics will target your exact needs so your skin feels clean, clear and radiant! *Luzern formulations increase 02 uptake by 20% through the active ingredient biodyne. ** In addition to the oxygen uptake delivered by properties of Luzern formulations an 02 infusion increases 02 uptake of the skin by 90%. Instantly boost skin’s vitality and reverse the signs of aging with this next generation, age-fighting facial. Two specialty masks are applied to energize, repair and brighten. The finishing oxygen blast will diminish fine lines and wrinkles, restore suppleness, and unveil a luminous complexion. Combine this therapy with TriPollar RF for the ultimate skin transformation. An ultra luxurious skin therapy featuring the power of oxygen paired with a collagen synthesizing complex and a pure collagen mask designed to boost radiance and firm skin surface. Luxury knows no boundaries with a collagen hand and foot treatment infused with ultra nutritious Argan oil designed to reverse the signs of aging. Experience PURE luxury with a Red Carpet regimen designed to “WOW”! Bi-weekly facials over a 12 week period will allow for optimal Oxygen Dermal Rejuvenation; a therapy that has only been offered in the finest spas and skin care clinics worldwide. Experience a skin revitalizing system designed to increase microcirculation and promote rejuvenation. This clinical therapy triggers collagen production for superior anti-aging results and responds effectively to hyper pigmentation, non active acne, scarring and more. Vital nutrients and vitamins are readily absorbed through the skin bringing about profound results. Allow our skin experts to renew and restore youthfulness through the assessment of skin and the application of nurturing and nourishing actives. This skin therapy is tailored according to your needs, addressing a variety of skin concerns such as hormonal imbalances, premature aging, sun damage, loss of vitality, tone and radiance. Enjoy a fresh, luminous complexion! Activate skin naturally with this pampering therapy! Offering a wide spectrum of botanicals and superfoods paired with therapeutic manipulations, this face therapy provides rejuvenation on multiple levels. Soothing massage techniques extend from the face to the hands and feet, inducing deeper relaxation. Experience a therapy that is truly beyond beauty! Be unconstrained by time in the presence of each other while relaxing in a nuturing environment. Nourish your skin one cell at a time with extraordinary and protective skin care tailored according to your skin needs. Pressed for time? Enjoy the benefits of a quick pick-me-up mini facial during your lunch hour. Experience increased hydration levels, refined & smoothed skin or reduced wrinkle depth when treated with one of our professional skin care lines. Enhance this therapy with a lip blooming & soothing eye treatment or create a deep cleansing facial with extractions & intensive exfoliation. Dare to bare your back with this indulgent therapy! An opening ritual stimulates your senses while highly specialized skin care selections cleanse skin, remove impurities and lock in moisture. The ultimate replenishing therapy for this hard to reach area! Customize your face treatment by adding one or more of these relaxing or targeted therapies for the ultimate experience. * These massage options only available with a facial or body treatment. ** Receive 10% OFF all Jane Iredale purchases after your make-up purchases. Making ongoing Wellness Therapy part of your personal wellness plan allows you to be calmer & more grounded; inspired & uplifted; beautified & more radiant, both inside and out! Our goal is for you to achieve optimal physical and mental harmony which will allow you to be better for everything else that you give yourself to.